I love the Super Bowl. This year, mostly for the food and halftime show. My team isn’t in the big game or I would feel differently. My house would be decked out in black and teal, and I would be figuring out any way possible to make all the food look like little jaguars. Lucky for you, I suppose, unless you too are a jags fan… then we can be bummed together. If you are a foodie, I am sure you feel me on the food aspect of Super Bowl being just as, if not more, important as the game. I mean, what fun is it to cheer empty handed? Those hands need to be holding snacks and beer as they flail about and participate in the wave. A few weeks out from the Super Bowl my mind shifts into creative over-drive. Must. Have. Kick arse snacks. Boy likes to, constantly, poke fun and call me “beautiful mind”. This is probably because I will drop everything I am doing, and start to sketch styling ideas for photo shoots or jot down ideas and inspirations for my next culinary adventure. When I say ‘’drop everything’’, I am being literal. Mid movie, I will just get up from the couch and grab my notepad. Mid REM cycle, amidst sweet dreams, I’ll awake and start writing. Lots of times my jotted notes and scribbled sketches look like equations… to him at least. That is because he doesn’t see what I see. I see culinary genius in progress. 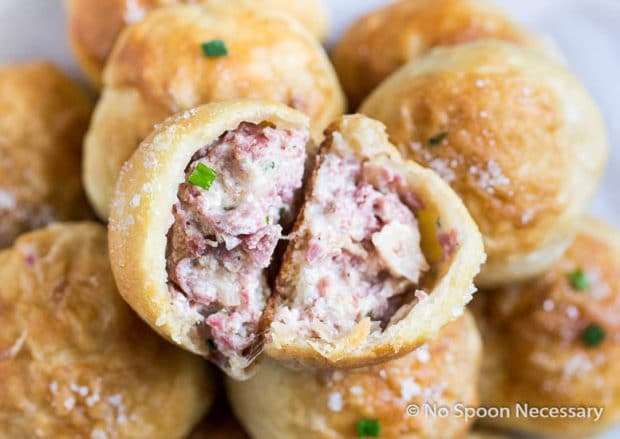 These Reuben Stuffed Pretzel Bombs are exceptionally delicious. Eating one, or a dozen, of these will absolutely make your taste buds do a little touchdown dance. The Reuben filling has all the makings of the classic sandwich, and then some. Corned beef, sauerkraut, Swiss cheese, Thousand Island dressing… check (x4)! 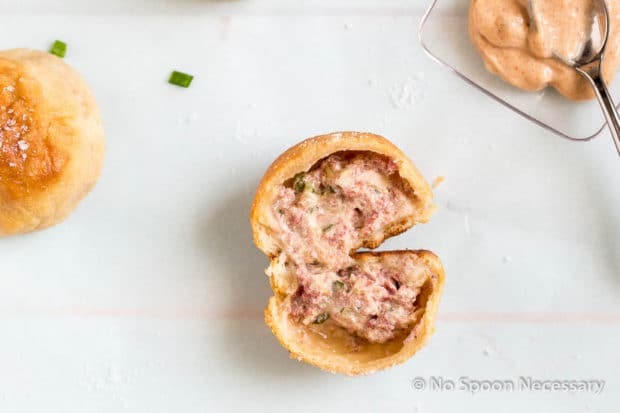 Plus, a pinch of chives for some mild onion flavor, gruyere for a little nutty, cheesy decadence, and cream cheese to make the filling extra creamy and dreamy. The Reuben filling on its own is amazingly tasty. And, you can certainly bake it, as is, and serve it with some toasted marble rye bread. But why stop there, when you can really throw this one into the end zone for a touchdown? And stuff that Reuben filling into soft, salty, chewy, buttery pretzel dough! 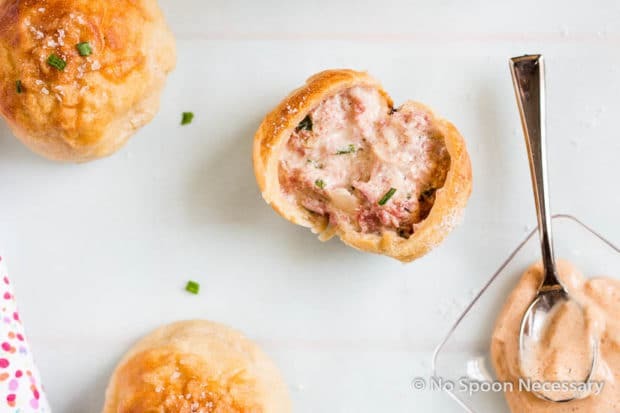 I could go on and on about how amaze-foot-balls these Reuben stuffed soft pretzels taste, but you should most definitely make these and see devour for yourself. So go grab yourself a beer (if you are 21 or older) and tackle this recipe. Blue 42. 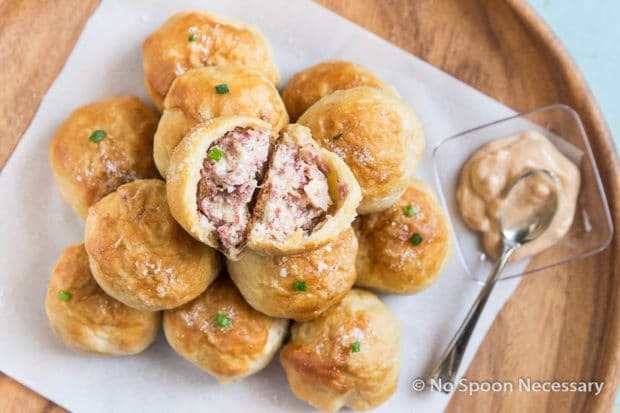 Reuben Stuffed Pretzels for you. Hike!! I’m lame I know, oh well. Until next time, cheers! Everything you love about a Reuben sandwich stuffed into a pretzel roll! 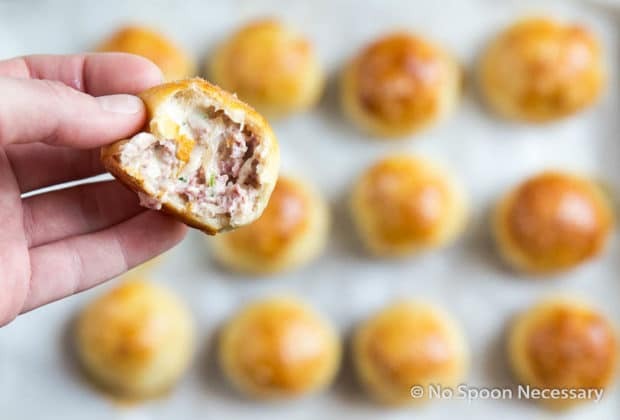 These bombs are perfect for snacking, game day and the super bowl! For Filling: In a medium sized mixing bowl combine all Reuben ingredients. Stir well to combine. Taste and adjust for seasoning. Cover, and place in the refrigerator until ready to use (this will also allow the flavors to develop). For Pretzels: Warm the milk and beer to 105-110 degrees F in a small saucepan or the microwave. Pour into the bowl of a stand mixer fitted with a dough hook. Sprinkle yeast and granulated sugar into bowl and stir to combine. Allow the yeast to soften and become foamy, about 5-10 minutes. Add the brown sugar and 1 cup of flour, mix at low speed for 45 seconds - 1 minute, until combined. Add the butter and mix at low speed for 1 minute. Add the remaining 1 ¼ cup flour and the kosher salt to the bowl. Mix on medium-low speed until dough comes together in a small, smooth ball, about 3-5 minutes. The dough should be slightly tacky, but not sticky. 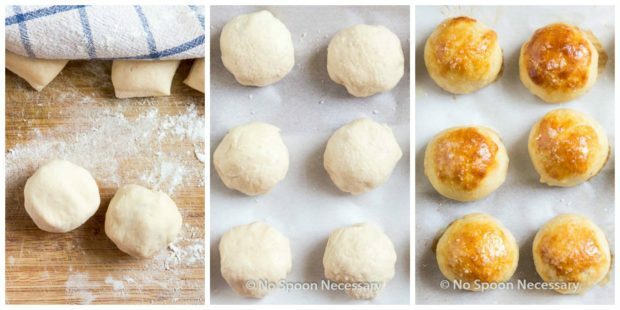 If dough is sticky, add more flour, 1 tablespoon at a time until smooth, tacky ball forms. 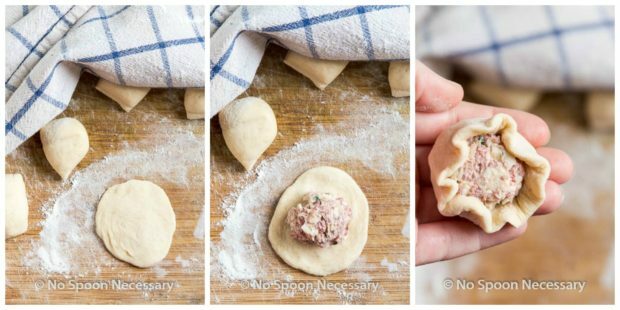 Remove dough and form into a ball. Spray the mixing bowl with non-stick cooking spray and place dough ball back into bowl. Cover with plastic wrap and let dough rise, in a warm spot, until doubled in size, about 1 hour*. 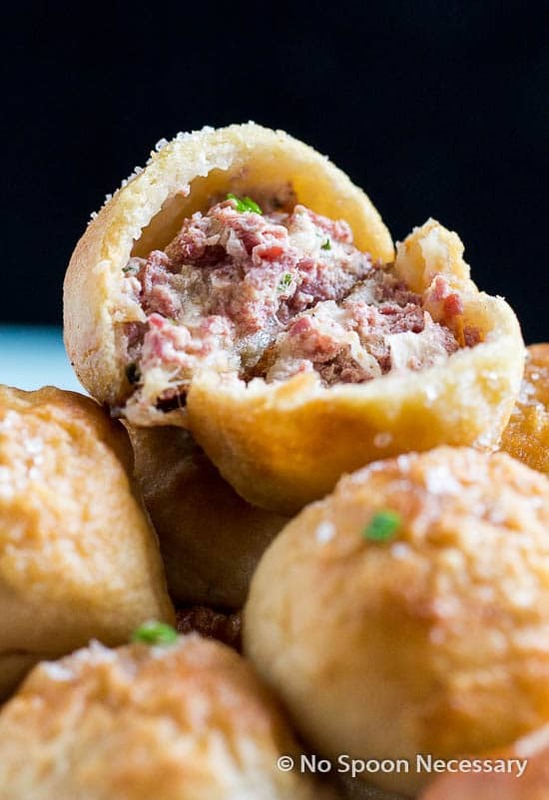 To make Reuben Bombs: Punch down the dough to deflate and turn it out onto floured work surface. Cut the dough into 36 pieces. To do this, quarter the dough and roll each quarter into cylinder. Cut the cylinder into thirds, roll each into another cylinder and cut into thirds again, to yield 36 pieces. Working one at a time, roll each pretzel dough piece into a ball and flatten it into a circle with your hands. 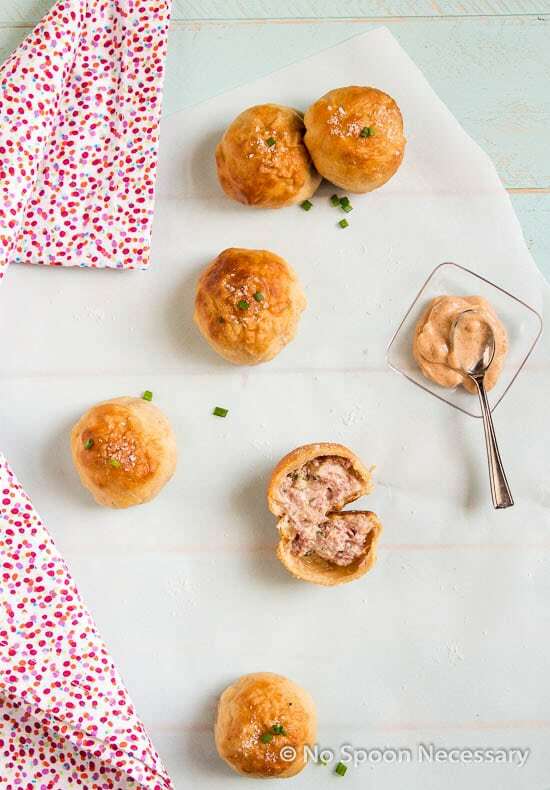 Place 1 tablespoon of Reuben mixture into the center of each dough circle. Gently pull up, and wrap dough over Reuben mixture to enclose. Pinch the edges together to seal. 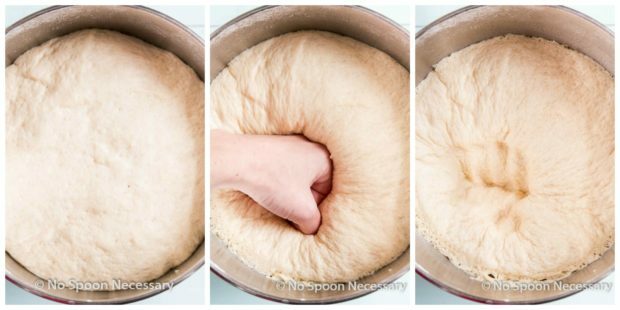 If the dough tears, lightly dust your fingers with flour, pinch tears together, and gently roll to form ball. Place formed ball off to the side on your lightly floured work surface and repeat with remaining dough until all the balls are formed. 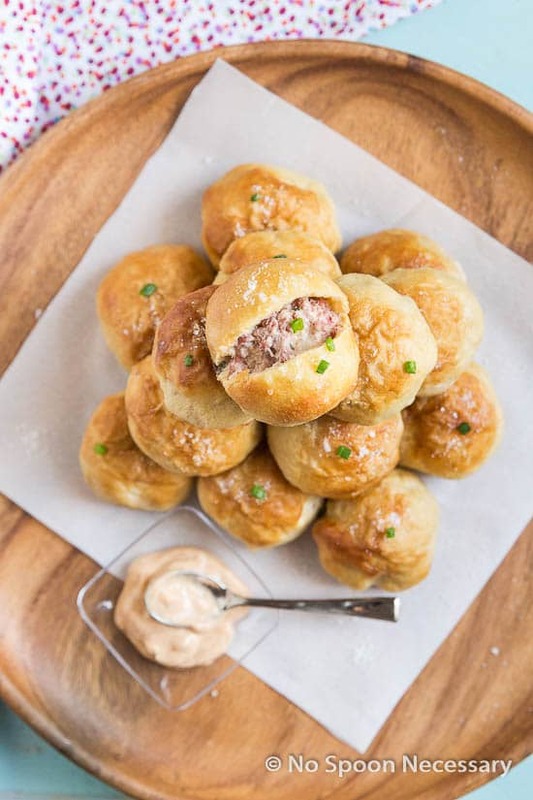 Keep dough balls covered with a damp kitchen towel, or plastic wrap, while flattening and stuffing pretzel balls. Preheat oven to 425 degrees F. Line a baking sheet with parchment paper and set aside. Lightly flour a clean work surface. Warm 3 cups of water in the microwave until bath water temperature. Pour water into a shallow baking dish or medium sized mixing bowl. Add baking soda and stir to dissolve. Set aside. Bake, on the middle rack, for 8-12 minutes, or until golden brown. 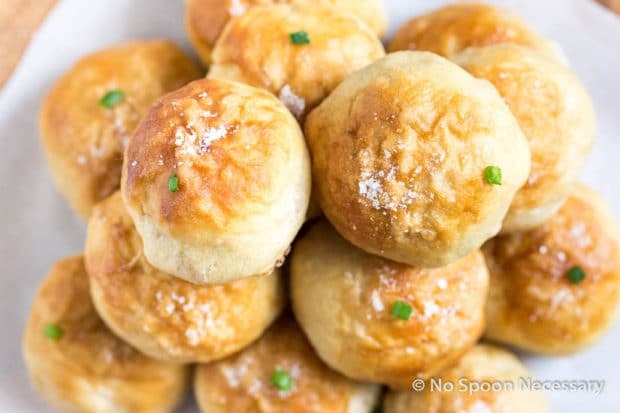 While pretzel bombs are still warm, use a pastry brush to brush tops with melted butter and sprinkle with sea salt. Transfer to a plate and garnish with chives. Serve with additional Thousand Island dressing for dipping. Enjoy! *To make a warm, draft free, place in your house for dough to rise: Before you start measuring ingredients, turn your oven on to the lowest possible temperature. Turn off when oven temperature reaches 80-90 degrees F. Place your dough, in its covered bowl, in the oven to rise. 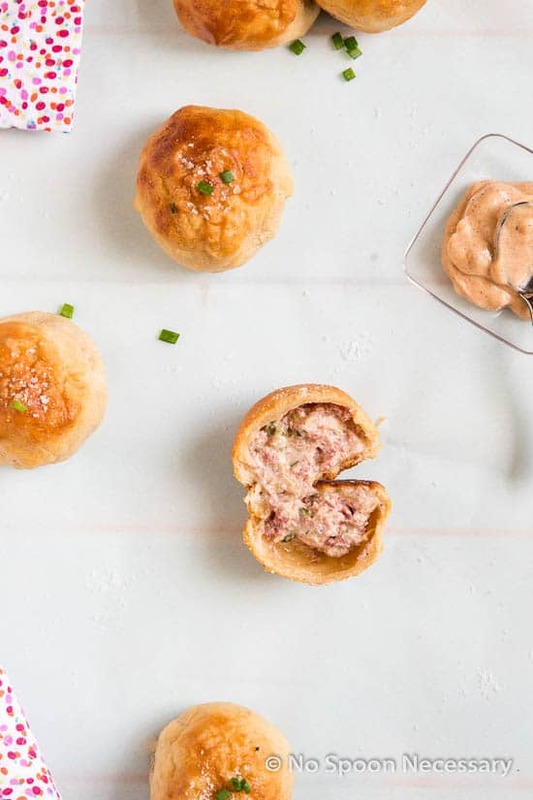 These sound like a great Super Bowl option, but might take the lazy woman’s way out and use frozen dough! 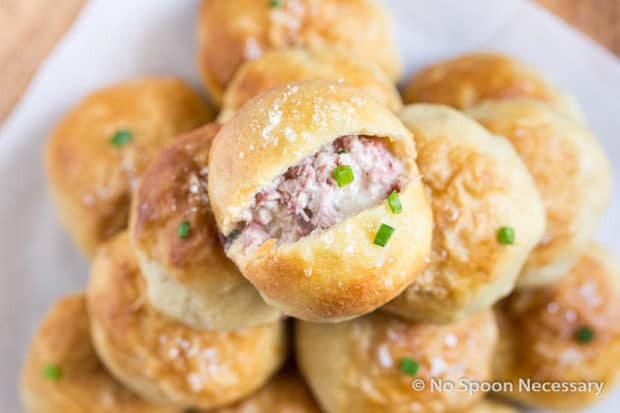 Deborah, There is absolutely nothing wrong with the “lazy” way… as a matter of fact, next time I make these I might follow your lead and use frozen dough. If you do give them a try, I hope you love them as much as I do! Thank you for stopping by and Cheers!! 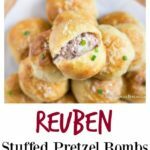 I’m only semi bummed – because if they were in the superbowl, then you wouldn’t have created these AWESOME pretzel bombs! Seriously drooling! Jen/Emily, you are totally right.. I guess I, also, should only be semi bummed, because these stuffed pretzels were the “bomb” (lame pun intended). Thank you so much for the kind words and for stopping by the blog!! Cheers!